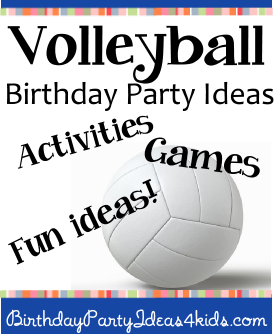 Fun Ideas for a Volleyball Birthday Party theme. Buy or make from cardstock white circular cards - can be a note card type or a simple one panel circle. Write party information on the back and sketch volleyball lines on the front. Buy white (or your teams colors) large round suckers and round address labels a little smaller then the suckers. Print out party information on the labels and attach to the suckers. Tie white helium balloons to the mailbox to show guests where the party is located. Add in a few accent colors - like your teams colors - with the white balloons. Draw lines on the balloons with a permanent marker to make them look like volleyballs. Attach a net to each side of the party entrance and above the door frame. If you will be playing volleyball outside make it a beach feel by putting down some sand on the walkway to the party. Buy or make volleyballs from cardstock or poster board and hang them with ribbons from tree limbs leading into the party. Cover the main party table with a solid color table cloth and draw net stripes on the table cloth - you can also make the netting by using striping tape. Use large white plates and accent with colorful napkins, cups and flatware. You could also drape a large volleyball net around the sides of a party table. Decorate practice t-shirts. Buy shirts (or ask each guest to bring their own) and let them decorate the shirts with iron on letters, fabric markers and paint. If your theme will be about beach volleyball let the guests decorate a pair of flip flops with fabric or ribbon. Easy instructions are on our site for Flip Flop Craft. In a large clear plastic jar with a tight lid place lots of different types of round candies like bubble gum, skittles, etc. Before the party count the candies as you are placing them in the jar - remember to write down the amount and keep it in a safe place. When guests start to arrive ask them to guess how many candies are in the jar. Write down their name and their guess. At the end of the party read off the guesses and find out who is closest to the actual amount . The person closest to the number in the jar wins the jar and the candies inside! 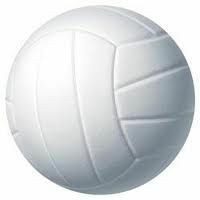 Play this fun party game inside using a white balloon for the volleyball. Set up a volley ball court inside by placing a real volleyball net 4 to 5 feet from the floor or string a piece of rope across the court the same height. Divide into two teams and have teams take off their shoes and lay on their backs on the court. Play volleyball using only feet - no hands! Before the party print out a list of Truth or Dare questions - we have a huge list here to print out for free. Cut them into individual strips - fold so that the truth question or dare cant be seen- and place one by one into balloons. Blow up the balloons and tie. During the party give each girl a balloon. On "go" they must keep their balloon in the air by hitting it up with their hands. If someone lets their balloon hit the floor they must sit on their balloon to pop it and do whatever is on the paper. For more fun Water Balloon Games see our page of over 50 ways to have fun with water balloons. Set up some volleyball relay races. Divide the guests into teams and have them all line up one behind the other. Set up a "turn-around-point" at the opposite side of the playing field where they will have to run across the field, around the point and then back to their team. Once they are back then the next person in line goes ... continue until each team member has completed the relay. - Have one player start down the course and then they throw the volleyball back to their team - the team then throws it back to them and this continues all the way down the course. They must throw the ball a minimum of 5 times down the field. If they miss a catch or if their team misses a catch that person has to start over.